Some may call it by other terms with more negative connotations (i.e., stubbornness, bull-headedness, etc. ), but if viewed from a slightly more positive perspective the same traits are found in the admirable quality of persistence. The volunteer daisies that chose to come up in the garden's potted palms came up amidst a weed that I allowed to grow so the birds had something for nesting material (it's a favorite of theirs). I also like the tiny melon colored blossoms on this "weed" and it's cascading greenness when almost everything else in the garden is dormant. The little white volunteer daisies are no bigger than a largish button, so it's understandable why I almost missed them because of the cascading fountains of green weedy stems around them. In the past week, the weedy stems and leaves have begun to turn brown. The life-cycle for this plant seems to be quite short and seasonal with the winter rainy season. But I noticed that the little white daisies still persevere with small persistent tenacity. They grow, while the other larger "weed" that was dominant not too long ago, wilts and fades. It is this sort of persistence that I admire in plants and in people. Today's social, economic, and political climate has many once-dominant entities fading and withering. 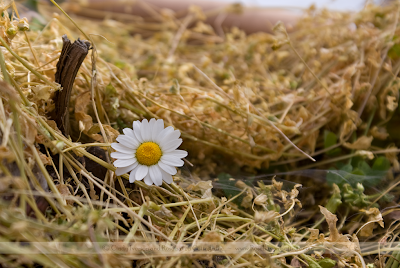 The "small white daisy" people that were once overshadowed by the short-lived "weeds" are hanging on. No bigger than they were before, these individuals are now visible. They are the small bright points that others can focus on to gain their own sense of persistent faith and tenacity. That is how we all will end up flourishing through everything--by focusing on the small simple beauties that were always there and using them as inspiration to become that ourselves. I love this analogy! You're definitely one of the daisies! Cindy, I like that description -- persistence. And that little daisy surely had a pile of it to pop up through all that dry grass! Beautiful analogy to society today. I've often thought that we need a whole new mindset as a whole, and the "small white daisy" individuals just might have the answer. Precious little flower. I love your analogy. You are so good with words. Amen! I think those little daisies are adorable.